Exceptional detail makes this floating alligator head a valuable deterrent for unwanted pond visitations. 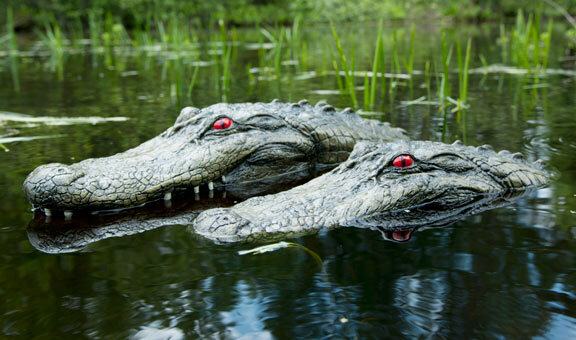 Frighten pond predators and unsuspecting friends with this realistic reptilian replica. Gator Pond Decoy is sure to make heads turn whether wildlife or human. Exceptional detail makes this floating alligator head a valuable deterrent for unwanted pond visitations. Gator decoy floats freely across koi ponds and water gardens, demonstrating life-like motion with wind or water movement. Reflective red eyes add to realism. Great for any water area infested with geese, ducks, egrets, cormorants, herons and other unwanted wildlife. Made from durable urethane foam. Protect prized koi and other pond fish with your very own "guard gator." This 22½ inch floating alligator floats freely and life-like in the pond or pool. The 22½" long x 8½ " head moves realistically with the wind and water. Birds think that they're being followed by a predator so they leave for a safer area. Made entirely in the United States. The Jr Gator Pond Decoy measures 22½" x 8½" x 3" high. Provide a safe RETREAT for koi. Predators cannot eat your fish if they cannot catch or find them! Use an underwater shelter placed on the bottom of the pond to create a secure haven from predators. Also, make sure your pond has plenty of floating vegetation and structures for your fish to hide under. REPEL unwanted animals away with ultrasonic devices, sprays and chemical repellents, and decoys. Spray repellents use smell and taste to ward off unwanted visitors like deer, squirrels, and raccoons. For best results, they should be applied frequently, especially after rain. Herons are big threats to pond inhabitants. Since Herons are territorial, the use of a heron decoy will make it appear that your pond has already been claimed. Owl decoys may help deter other predators who wouldn't risk being attacked by another natural predator. For the best results, the decoys should be moved often so the predators don't catch on! RELOCATE predators with traps. Use traps designed to humanely capture and hold pond predators. Safely capture and relocate nuisance animals to protect prized koi. Provide an alternative food source away from the pond to draw predators away from your koi. Watch the video below to see how a Heron can eat a large fish. From Paul Hudgins of Jax, Florida on 3/8/2016 . From Debra Priebe of Shakopee, Minnesota on 4/29/2015 . From Ron S. of Alpharetta, Georgia on 9/26/2014 . From Ralph Meyer of Mount Vernon, Missouri on 6/26/2014 . From Senoia McGreggor of Clopton, Alabama on 6/6/2014 .